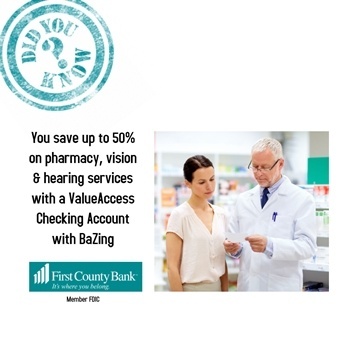 Did you know that you can save up to 50 percent on pharmacy, vision and hearing services with a ValueAccess Checking Account with BaZing? A ValueAccess Checking Account with BaZing offers savings, discounts, and benefits. Download the BaZing App1 on your smart phone and BaZing will let you know when there is a deal at a restaurant or retail store in your area. This includes online access and mobile. See disclosures for terms and conditions. 1 Carrier fees may apply.